On July 10th, Janet Bonnin talked about her son’s accident in one of her Tuesday Tips videos, and how it gave her family a wake-up call. She spoke about the realization that her family needed certain steps to be able to communicate better. Janet shared those steps with parents to help them have a great relationship with their children. She talked about the importance of always checking-in with your children, being consistent, and above all, showing them love, no matter what. Today I want to talk about the process of teaching our children how to be resilient so they can be strong enough to surpass whatever comes their way. One thing I have seen in recent years is the increase in child depression, the rampant number of young teens overdosing, and commiting suicide. By some estimates, depression is about ten times more common now than it was fifty years ago. As a mother and family advocate, I am very concerned about the rise of depression in children and teens. I am saddened by stories of former classmates my daughters had in high school, that have overdosed due to drug use, or have committed suicide. The common factor was depression associated with deep feelings of sadness, loneliness, and that the child had expressed no one was there to listen or love them. When I was 5 years old, I remember being at a funeral of one of my mother’s cousins. She was very young and died of Cancer leaving two little girls. I had played with them before and remembered visiting them at their home. Even though I was 5 years old, I could understand their pain, and I wanted to hug them and cry with them. We were all around this casket crying, and it was very painful to see all of these adults in such pain. "During moments of death in the family, we can take the opportunity to teach our kids about death being a part of life, and how we can cope with it through our own example." My first experience with death was there, and one of my first experiences with a resiliency lesson came to me vividly as I saw one year later these little girls, my cousins, playing in the yard and smiling as if nothing had happened. I thought to myself: “don’t they miss their mother?” In reality, they did, and years later as we grew up and shared moments as teenagers, they expressed they missed her every day. Their resiliency came because their grandmother, and their aunts, uncles, and cousins, were firm in giving them love and attention. This experience shows how the love of family and friends is very important in the face of loss and grief, pain and suffering. With so many bad things happening in the world, and so many trials we have to go through, the medical field has grabbed attention to the matter, and training is being offered to educators on positive education, to help children and families develop a healthy resiliency. According to Dr. Martin E. P. Seligman from Penn State University, in his Resilience Training for Educators, schools should teach not only how to succeed in the workplace, but also provide positive education: which is resiliency and how to be happy. Two good reasons that well-being should be taught in schools are the current flood of depression and the nominal increase in happiness over the last two generations. A third good reason is that greater well-being enhances learning, which is the traditional goal of education. In the meantime, while schools develop a better curriculum that includes positive education, we as parents have a goal to help our children gain an understanding of resiliency. Resiliency is a dynamic process. It provides a positive adaptation when encountering stress, trauma or tragedy. It offers an opportunity for self-discovery and serves as proof that you have grown as a result of your struggles. 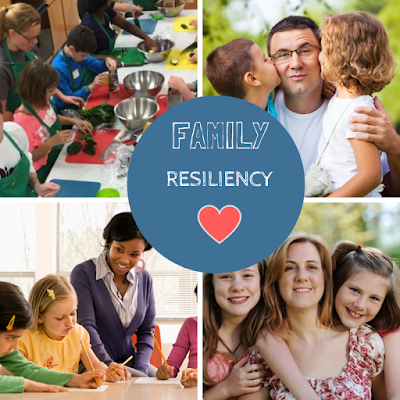 On the next blog, I will discuss what is resiliency. If this blog helped you, or if you would like to comment on the box below, please do. Share this blog with your friends and family on your social media. We want to help others have a healthy resiliency. Thank you for reading and sharing.